Nevil Shutes most beloved novel, a tale of love and war, follows its enterprising heroine from the Malayan jungle during World War II to the rugged Australian outback.Jean Paget, a young Englishwoman living in Malaya, is captured by the invading Japanese and forced on a brutal seven-month death march with dozens of other women and children. A few years after the war, Jean is back in England, the nightmare behind her. However, an unexpected inheritance inspires her to return to Malaya to give something back to the villagers who saved her life. But it turns out that they have a gift for her as well the news that the young Australian soldier, Joe Harmon, who had risked his life to help the women, had miraculously survived. Jeans search for Joe leads her to a desolate Australian outpost called Willstown, where she finds a challenge that will draw on all the resourcefulness and spirit that carried her through her war-time ordeals. 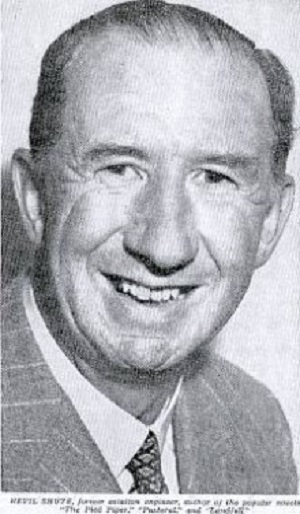 Nevil Shute Norway was born in 1899 in Ealing, London. He studied Engineering Science at Balliol College, Oxford. Following his childhood passion, he entered the fledgling aircraft industry as an aeronautical engineer working to develop airships and, later, airplanes. In his spare time he began writing and he published his first novel, Marazan, in 1926, using the name Nevil Shute to protect his engineering career. In 1931 he married Frances Mary Heaton and they had two daughters. During the Second World War he joined the Royal Navy Volunteer Reserve where he worked on developing secret weapons. After the war he continued to write and settled in Australia where he lived until his death in 1960. His most celebrated novels include Pied Piper (1942) , A Town Like Alice (1950) , and On the Beach (1957) . Photo by w:Australian Women's Weekly [Public domain], via Wikimedia Commons.